Interested in finding out what the most innovative Europeans are up to? What about a chance to have your say in European startup policy making? Or perhaps you have an entrepreneurial project that deserves recognition on European level? You are in the right place! In this edition of the SME Week Newsletter find out about the latest EEPA 2018 updates, the recent Ideas from Europe finals, an opportunity to contribute to EU startup policy and more. Read on to find out more and don’t forget that we want to hear YOUR stories, so get in touch to see yourself featured in upcoming editions. This week on 24 April in the Hague, ‘Ideas from Europe’ kicked off the joint development of shared purposes to take on global challenges. 12 inspiring entrepreneurs showcased their solutions and the audience, consisting of 500 European guests in the venue and many more watching via the livestream, elected the following three solutions as most relevant: Micreos, with the world’s first targeted antibacterial product; ApisProtect, using in hive-sensors, retrofitted into existing beehives to unobtrusively monitor honey bee colonies; and Too Good to Go, a smartphone application that helps restaurants and food sellers sell their surplus food instead of wasting it, thereby fighting food waste. Ideas from Europe is an independent platform that facilitates the development of an idea into a mature, sustainable solution and connects all parties needed in this process. During biennial validation cycles, ground-breaking solutions to global challenges are scouted and validated in the EU. Part of this ongoing process are podium events throughout the EU, where innovators present their solutions and stakeholders participate. Sustainable initiatives are first validated by Ideas from Europe on their basis of their benefit to society, taking into account all perspectives at once: societal, economic viability, feasibility and scalability. Once validated by the public, these ideas are subsequently launched by Value Tracks. The Value Track method focuses on joint development by market parties such as government agencies, innovators, investors, companies, scientists and citizens. The main advantage of this method is that it helps make mutual dependencies transparent, which allows for collaboration and new agreements. But what about new value tracks? Ideas from Europe are taking their question global, and asking the general public what shared purpose they feel is the most relevant from their perspective. To vote for your favourite solution, go to the Ideas from Europe website and leave your opinion. The global choice will be announced on 6 July 2018, during the SME Envoy week in Cyprus. Missed out on the finals? Or want to relive the excitement all over again? Watch the recorded livestream of the entire event here. Today’s post comes from Ideas from Europe who have an announcement that we have all been waiting for…who is the wildcard winner? 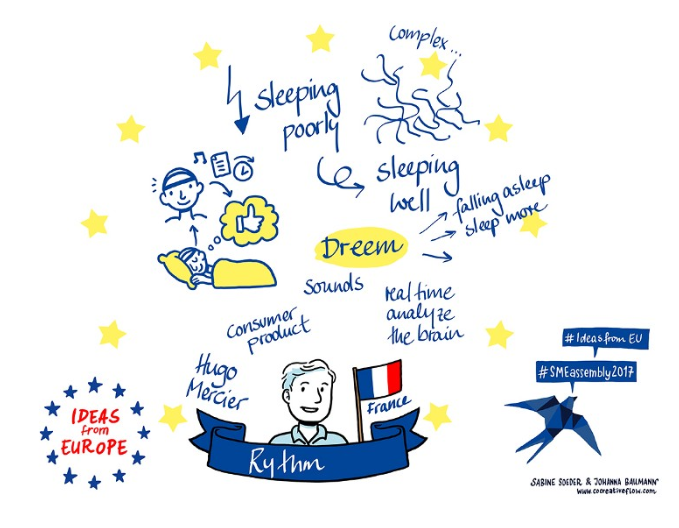 A dream has come true…Hugo Mercies from Rhythm’s DREEM has been voted as the twelfth speaker for Ideas from Europe! 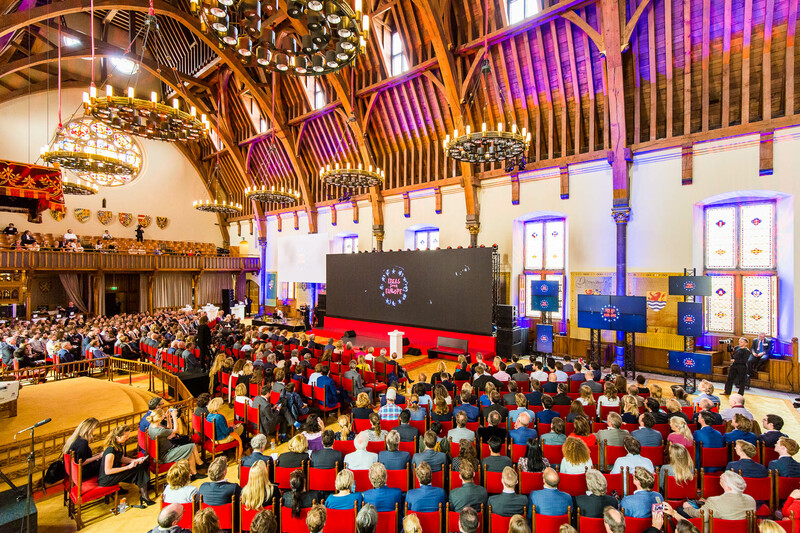 Thousands of votes were cast over the last two months, in order to find the twelfth speaker that will take the Ideas from Europe stage on April 24 in the Knight’s Hall in The Hague. It was a tough battle, particularly in the last two weeks, which ended with a real sprint for the finish over the last days. We would like to extend a big round of applause to all of our candidates who fought with great energy and effort and were able to mobilise public support! With 37,5 per cent of the votes, DREEM was chosen to share their breakthrough wearable technology that improves deep sleep quality. Not only by studying our sleep behavior, but also by actively enhancing our deep sleep, which improves both cognitive and physical performance throughout the day. 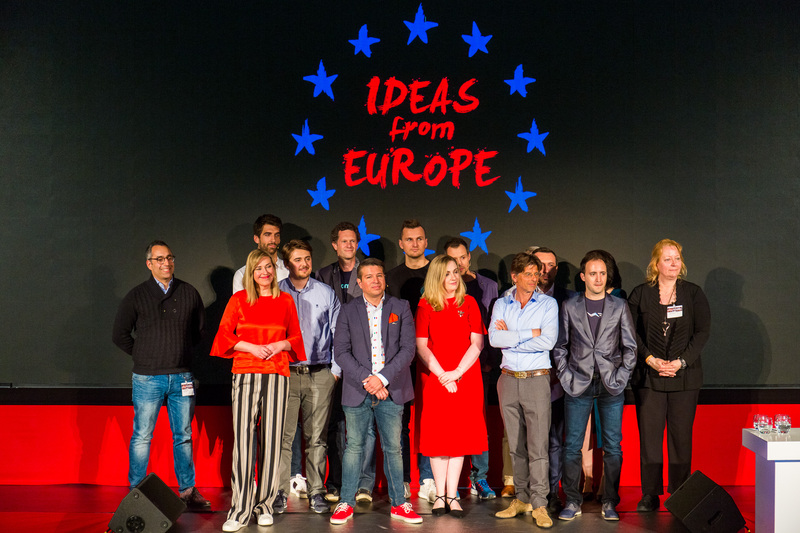 We would like to thank everybody that voted for their favourite idea and to remind you that in addition to the finalists, all of the semi-finalists will be attending the Ideas from Europe event in April in The Hague. Congratulations Hugo, we look forward to welcoming you on stage! Watch Hugo Mercier sharing the Rhythm solution at the semi-finals in Tallinn in November 2017, and watch all the other Ideas from Europe here. Find out more about Ideas from Europe on the Promoting Enterprise Portal. In under a month’s time, the nine most inspiring ideas from entrepreneurs with the potential to change the world will be chosen from across Europe’s 28 Member States at the Ideas from Europe Finals at the SME Assembly in Luxembourg on 20 November. The initiative, which started in spring, aims to show that Europe’s future is in the hands of today’s entrepreneurs as they are the creators of businesses and jobs. By sharing their ideas they will inspire and encourage people to use their entrepreneurial spirit and, in turn, become the lifeblood of Europe’s economy. Following the selection at the SME Assembly in Luxembourg and the online vote, the top ten ideas will then go through to a final judging session at The Hall of Knights on 31 March 2016 in The Hague. Fleye is the brainchild of Dimitri Arendt and Laurent Eschenauer, two experienced engineers passionate about drones. It all started as a prototype hacked over numerous week-ends in Laurent’s attic, and is now a funded venture company, founded in December 2014 and supported by The Faktory, a private Tech Startup Accelerator and Seed Investment Fund from Belgium. Rennie is the founder of Embrioo.com – an Open Innovation platform recognized by the International Jury at Creative Business Cup in Copenhagen (Special Prize Winner, 2013); Winner at Innovation challenge by IF Sheffield University (2012), TEDx speaker, featured in Forbes. Arestis Vrontis , founder and Technical Director of Helikas Robotics (2010). After a number of years spent studying Marine Engineering and Mechanical Engineering, Arestis went on to be production manager to “EPISKEVI” Machine Shop. Arestis has a lifelong fascination with robots and has tinkered with them for years designing and building multicopters and fixed wing aircrafts. He is also a member of Technical Chamber of Cyprus. Recently he has developed a vertical wind turbine for urban areas. Pirkka Palomäki is the COO & CTO at Enevo, a privately held company providing smart logistics optimization solutions for the waste management and recycling industry. Prior to joining Enevo he has worked at F-Secure Corporation in several executive management positions including the head of strategy, CTO and Interim CEO. Earlier in his career, he has been with Telecom Finland (currently TeliaSonera) in business development and product marketing roles. Palomäki was recognized as the CTO of the year in 2011 by the Technology Academy of Finland. Dr. Gerhard Dust started his career in the construction business. After service in the Luftwaffe and graduation from university he followed his family tradition of working in the book industry. Being COO of Libri 1991-2008, he earned an international reputation for the analysis, design and implementation of high level automated storage and distribution systems. In 2010, in the aftermath of the earthquake in Haiti, he founded PolyCare. Dr. Nora Khaldi is a mathmetician with a PhD in Molecular Evolution and the founder of Nuritas, a company that has revolutionised the discovery of health-benefitting molecules using artificial intelligence and machine-learning. Throughout her career, Nora’s ambition has been to disrupt the status quo and introduce new ways of thinking to address many of the health and sustainability issues facing the world today.